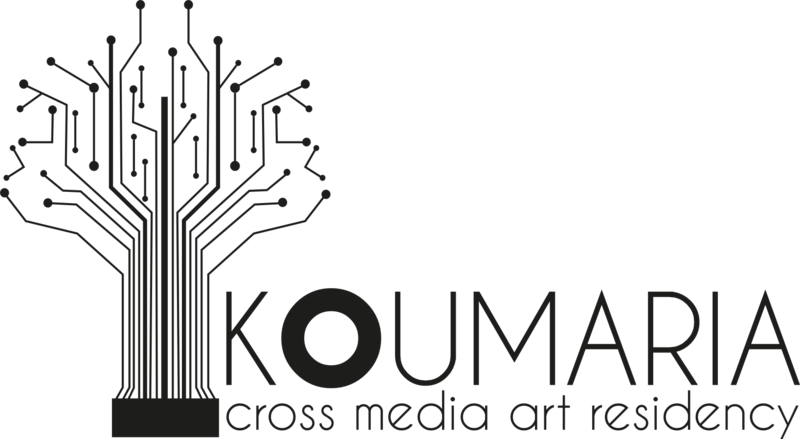 Koumaria Residency 2016 - Sellasia Showcase from Medea Electronique on Vimeo. Sunday is hangover, recovery from home-made red wine and tsipouro (traditional greek grappa). The celebrations for Eric’s birthday turned out to be an occasion for letting inhibitions go down. Dance and loud music have been the protagonists last night. Plus, Guido and Rolando have come in time for the dessert to be the new entries of the residency. They will help harmonizing it with intriguing rhythms and Italian jokes. Nevertheless, at 9 in the morning a group of resident is ready to go shooting the piece thought by Nadav. The camera frame functions as limit beyond which participants cannot go. The group starts as a compact block and, as soon as one person peels off the group, he or she falls apart. At 4, the dancers are driven to Sellasia city for a dance lesson with children. In the meanwhile, Akiko and Rasmus get prepared for their visual-music performance. It takes much to set the electronics and to connect the cables. 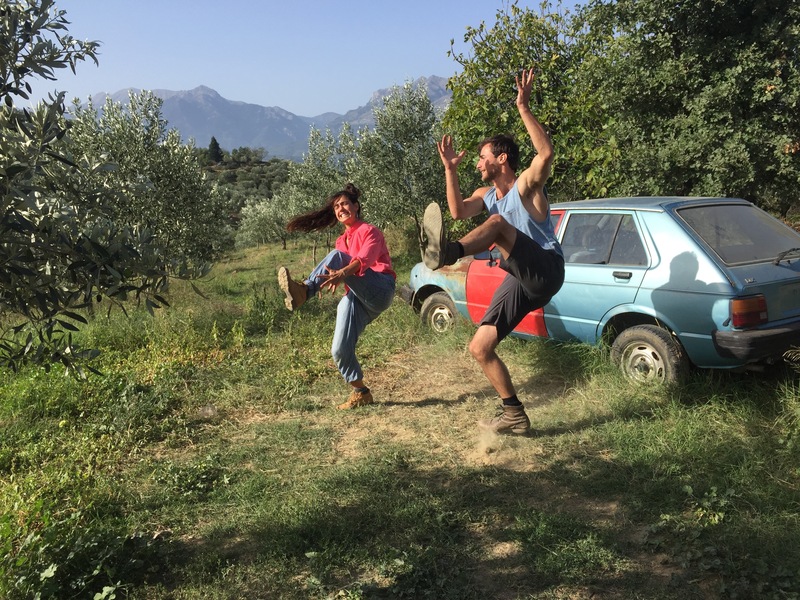 When the daylights are about to shut down, café Kanellopoulos in Sellasia gets ready to host two of the performances developed at Koumaria Residency in the past seven days: Akiko and Rasmus, with their alive sound painting, and Alex and Gabriella, with the live pulse feedback. The exceptional twist of the show is given by the improvised acoustic trio, trumpet-saxophone-double bass, played smoothly by Eric, Guido and Dimitris between the two live performances. The atmosphere is cozy and familiar. The show takes place in the little garden of the café, where people sit on little tables in front of a projector and a double-desk structure. Many citizens come around, sit on a table and, between a glass of red wine and a pita, enjoy the two-hours-long show. The mood of the residents is of relaxed concentration. Most of all, they want to have a first external perception of their works, observing the reaction of the public and the degree of efforts needed in order to improve them. Saturday at Koumaria, the second in a row. Seven days of ideas, projections, trials, shootings and rehearsals. Saturday of improvisation. Saturday of editing and audits. Eating, then eating again, having Greek coffee. Lucia wakes up very early for her daily sunrise shooting. This time, she makes the last test shoot before the real one, happening tomorrow. Nadav and Gabriella are out from 8 to 11 in the morning to go through their performance by an abandoned car. Later on, Toi and Gabriella work with Panos at the editing of the performance at the trashing floor. Dirar works on the editing of the video about memory and running, plus he starts building the concept for a short movie about national identity: he is trying to investigate the concept of the land, questioning who is the real owner of a land and where we can actually talk about identity related to a land today. In the afternoon Nadav, Rah, Rasmus, Gabriella and Toi are standing in circle in Koumaria’s garden, creating a concept for the performance on hospitality that Toi has in mind to do. We also shoot Lucia and then Dirar’s interviews, together with Alex and Eric’s. Ah, and today is Eric’s birthday. That means, we are going to celebrate it with food and wine! Medea Electronique - Eric Lewis from Medea Electronique on Vimeo. Koumaria Residency 2016 - Hossam Dirar [Egypt] from Medea Electronique on Vimeo. Hossam Dirar was Born in Cairo, Egypt in 1978 where he currently lives and works. He obtained a BA in Graphics from the Faculty of Applied Arts, Helwan University, Cairo. His later studies included Painting, Graphic Design, Printmaking, Mixed Media, Product Design, Photography, Multimedia and Pottery. Dirar’s work explores the factors that make humans different from one another, whether these differences are a result of social, religious or geographic influence. Dirar studies the transformation of the state and environment a human exists in through things that shape them, and in turn the environment becomes a reflection on humans in a wide range of ways, creating a spectrum of existence. Through his interactions with art he highlights this exchange, what happens between the environment and mind, and hopes to find ways to cancel out the differences. Dirar recently took on sound as a medium, he was attracted to the challenge of not using a visual reference, and enjoys its direct reference to the time in which it’s produced, that is a direct link to the technological advances of its time. Koumaria Residency 2016 - Lucia Jeesun Lee [Korea] from Medea Electronique on Vimeo. Lucia Jessun Lee explores questions on existential, metaphysical matters. In the process, she experiments with digital media, invites people to join, and creates experiential poetry. She has shown her works at Hexagone Scène Nationale Arts Sciences (France), Seoul Art Space Geumcheon, Platoon Kunsthalle Seoul, The 13th Seoul International New Media Festival, Singapore Open Media Art Festival, 3LD Art and Technology Center(New York), The 12th Dumbo Art Under the Bridge Festival (New York) and various venues in Seoul and New York. She has been invited to participate in Augmented Paper Workshop during Experimenta Salon Arts Sciences Technologies for 2015-2016 France-Korea year, and to Connecting Cities Urban Media Lab at iMAL, Brussels in 2014. Through collaboration with other professionals including Chilean visual artist, French sound artist, Korean programmer, Spanish architect and Trinidadian interactive artist, she often crosses borders of disciplines and nationalities. She has designed and taught art+tech classes in Seoul and New York, including Stevens Institute of Technology, Hostos Community College of CUNY , Queens Museum of Art and Fablab Seoul as an adjunct professor, educator and residency artist. Koumaria Residency 2016 - Akiko Nakayama [Japan] from Medea Electronique on Vimeo. Akiko Nakayama is a painter who depicts the beauty of convey energy metamorphosis through several media such as installation, photos and performances. Combining the energy of movement and the vibrance of colors, Akiko Nakayama brings pictures to life. Called “Alive Painting”, Akiko depicts the resonance between shapes and textures by using different types of liquids, each with a unique characteristic. She explores three themes in her work. Firstly, the parallels of extremes. Secondly, the resonance between these extremes when they meet. Lastly, the importance of water in bridging these extremes. In recent years, she has performed solo using a colour-organ system, “Fluid2wave”. This system uses soundtracks and sound effects to accompany the digital projection of color painting. She also collaborates with artists from different genres. She not only performs in Japan, but also overseas. Koumaria Residency 2016 - detail from Medea Electronique on Vimeo. Sleepy morning. People get slowly ready to start their own activities. At lunch time one could hear the heartbeats from Gabriella and Alex’s live pulse feedback performance, while Fawn works hard on her light/sound sensor and the atmosphere is of general quietness. A long walk to the white graveyard on the hill in front of the Residency. Then, Eduardo, Toi and Dirar go for a shooting at the close river. Toi’s idea is to make a triggering video composition in which the audience is able to choose how to continue the storytelling by selecting one between two videos. Besides, Dirar’s idea is to produce a video which communicates the dynamics of running, in the both symbolic and actual meaning. After the river, the group shoots in a couple of different other scenarios. After dinner, the second episode of Show and Tell takes place in the living room. Rah presents her video shot at the seaside, where she attempts to draw a line with her body between the sea and the sand. The symbolic reference concerns the ideological and perhaps illusionistic wish of resistance (to systems, schemes, structures). Fawn shows the two projects developed: on the one hand the light sensor has been put on a jeans shirt, that Toi wears to show movements and play with appearance/disappearance of light; on the other hand, Fawn gives a demonstration of how graphite on a paper, reacting to conductors, stimulates the creation of different kind of sounds, depending on the distance from the main reference dot. Kleopatra and Panos presented two videos of, respectively, the trashing floor and the visit at the Black Smith. The videos play with movement, resolution and aesthetic of images. Akiko and Rasmus have developed a better sound connection for their project: the sound now reacts to color variation. They will integrate this new feature in within the initial idea of visual painting and sound connection. Also Lucia updates the group on her idea of sunrise and sunset shot in order to create a unique line. She ultimately decides to be the only protagonist of the video installation. She will participate to another sunrise tomorrow. She basically recorded every sunrise and sunset since she is here. A perfect reporter of unique repetition systems. The night is long, the house never really sleeps. Everybody’s wish is to have a more concrete shape of the collective work. But… tomorrow is another day! 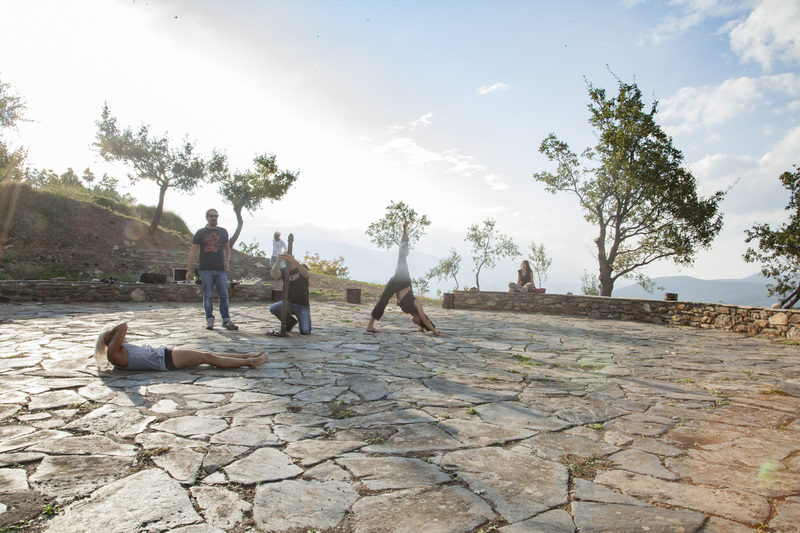 Also the fifth day at Koumaria Residency brings inspiring material in the house. Three shootings are sketched in the early morning at Mani, a seaside location two hours from Sellasia. Eduardo serves as cameraman for two projects. One involves Victoria and her project around the myth of Xenia, the goddess of hospitality. The other one, whose concept is by Hossam Dirar, is a theatrical/dance performance. The latter performance is recorded by Rah. Rasmus and Akiko go to the river in the afternoon, to record some sounds precious for their performance together. Later on, they make their second trial in Koumaria’s living room – even though Rasmus seems to have some troubles with his sound-checks. Also in the living room, for the second time too, Alex and Gabriella make some progresses in their live pulse feedback performance trial. Gabriella has to learn how to manage the sensors in order to slow down her heartbeats, in order to produce certain feedbacks in Alex’s computer system. Later on, they sit together to decide the narrative of another performance, the one concerning live coding. Gabriella has the creative direction of the “commands” that are going to be executed during the piece. Everybody looks really busy today. Lucia is again shooting the sunset. Nadav does the editing of the videos of the past days. Eric is as always here and there, as a perfect improviser does, to cook, play music, make the fire, drive people to places, have a little interesting talk with anybody. Manolis is the sweetest, in his moments of little anxiety and organization pressure. He is busy with his sound recordings for the most part of the afternoon. Kleopatra and Yorgos are the most business-like members. They sit all day on their desks, on the second floor. They are the reliable part of the residency, and the ones who go to bed later than everyone. Fawn has finished her motion sensitive dancing costumes, functioning with LED. When the dancer moves, the light is programmed to react. She has in mind to provide such “customs” for any kind of performance, being in such way a new-frontier custom designer. The dinner is being prepared by Kleopatra, Manolis, Eric and Gabriella. A good team, as already tested. Full day concerning trials and field researches. The residents divide in groups since the very morning. 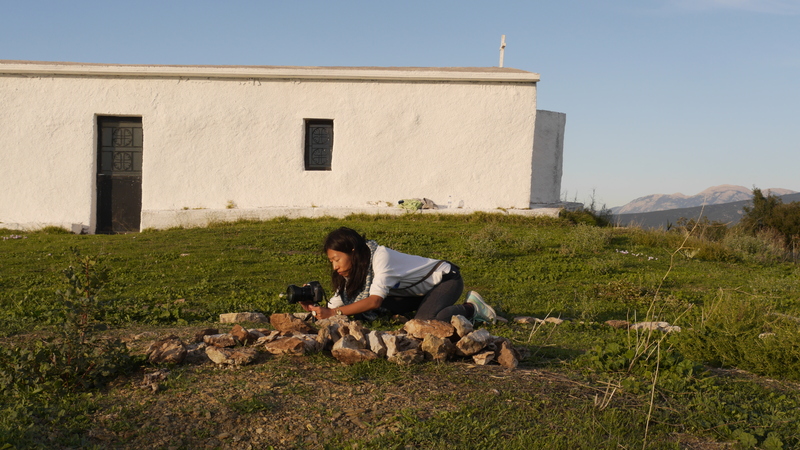 At 6 o’ clock a few of them record sounds and Lucia finalizes the shooting of the sunrise. Her idea is to create a double-screen video installation whose concept is to create a space to experience sunrise and sunset at the same time. She starts building a trail from the ruins of a fortress, so to make clear the passage between the sunrise and the sunset itself. For the rest of us, the first hours of the day are quite and slow. The engineers proceed conceiving their electronic-connection work. Gabriella and Toi, assisted by Manolis and Kleopatra, go recording their dance performance at the trashing floor. Nadav directs his own movie at an olive press. The performance is thought to be collective: people are moving into space unites, in a dance rehearsal marching. They have a certain amount of steps and they get to a border which they realize they can’t cross. So they change direction every time. The video is shot from different angles. In this march, every person suddenly drops until there are no more. Each person is finally eliminated by the march itself. After lunch time, Nadav and Rah drive to an abandoned hotel to do a dance shooting. The dancer is trapped in a cage, trying to escape. At 18.00, Lucia and Fawn go shooting the sunset together, while Alex and Gabriella design their first trial of live pulse feedback. Through sensors connected to Gabriella’s finger, Alex is able to feel and reproduce her heartbeats live. The speakers function through the computer. The concept includes the reproduction of a video, shot by night in the nature, which simulate a person running into a wild forest, escaping from something or somebody. One your later, Akiko and Rasmus have their first sound and alive painting trial. Both of them are strongly authentic in their art formats. They are able to give a sense of connection, even when not strictly planned. They want to create a connected performance between alive painting and experimental electronic music. Music would follow the movement of the painting in the same way that the movements of Akiko’s colors would integrate with the sounds reproduced. Moreover, they physically connect the iron pad where Akiko is doing her mixes of materials and colors with Rasmus’ electronic device system. After a delicious dinner, the group faces the first “show and tell”, consisting of a general demonstration of all the work done until that moment by the residents. In addition to the works already discussed, so many questions are asked and doubts are exposed by the artists. Some of them are still searching for a concrete representation of what they still visualize as a potential idea!